Leading CAD company paves the way by producing the only complete CAD software specifically for Arboriculturists. Consulting Arborists publish reports that effectively take hours to produce and are a challenge to manually create with traditional software. Without the right information or tools, reports look unprofessional, can be inaccurate and subject to adverse scrutiny. It is paramount that drawings included in these reports clearly define trees to be managed or protected so that should a dispute arise there is no ambiguity. Site plans supplied by surveyors only contain basic information relating to trees such as location and a simple (usually inaccurate) representation of canopy size. Satellite images can be used instead or as well but may not be up-to-date and often the canopy obscures the location of the trunk or other trees growing under the main stand. Arborists are required to do a SWOT analysis (Strengths, Weakness, Opportunities and Threats) of the trees in and adjacent to a particular site. Traditionally this was done by hand or by using software not directly suited to the job. This is where ArborCAD makes all the difference, providing arborist-specific tools in its own easy-to-use CAD program and carrying out all these processes automatically. All you need to do is load in your Excel survey schedule from the data you gathered on site or digitise the tree locations on the plan or aerial photograph, apply relevant information such as tree I.D., species, girth at the agreed height and any other data you desire such as description, health, maintenance etc. and the program calculates and draws all the relevant information in a single click. A symbol representing the trunk, a smooth curve for the canopy spread, special circles representing the RPZ and TPZ, the ID of the tree and any other data you choose to include then become an accurately plotted part of your drawing in an instant – shown in a clear concise manner that you control. It doesn’t matter if you have 10 or 100,000 trees to plot; it takes only a matter of seconds to do it. In another single command you can generate a complete table (schedule) of all the identified trees and their values and apply that to the drawing too. The time savings of an automated tool are not to be underestimated. If you are required to calculate the incursion percentage of activity as it relates to established trees on proposed construction sites, another two click tool does that for you too, presenting correct percentage value as text to place in your drawing saving hours of frustration and manual working out. 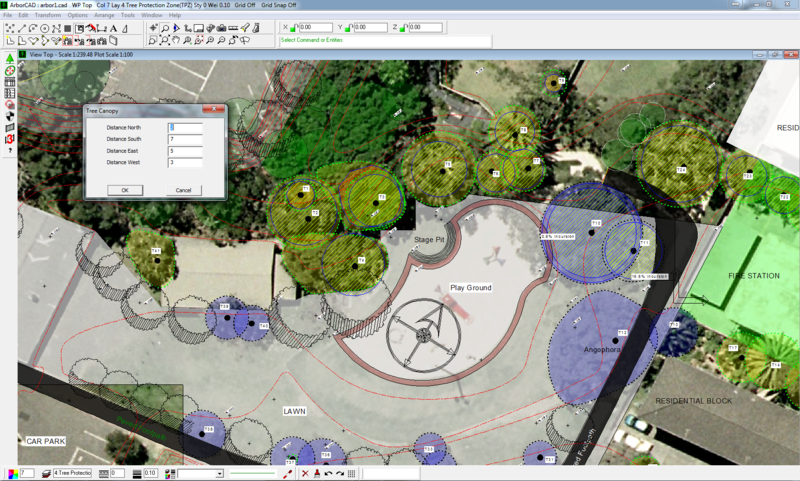 It will even accurately expand the protection zone circle by the incursion value to broaden the area of tree protection. As a professional, the idea of continuing to do these things manually seems as incongruent now as using a hand saw to fell a large tree. The challenge for consulting Arborists is simply to make a commitment to professionalism in the way you present your drawings in the reports you generate and to value your time so that you don’t keep doing it the old way when a new and improved way is readily available and affordable.